Former United Autoworkers vice president Norwood Jewell was a superdelegate in the 2016 nominating race and was set to be one of Michigan's official DNC representatives through 2020. Jewell pled guilty to corruption charges tied to the federal government's investigation into UAW's dealings with Chrysler executives on April 2. Despite his admission of guilt, Jewell remained listed as a party leader on the Michigan Democrat's website until the Washington Free Beacon reached out. His name has since been scrubbed from the website. Both the state party and the Democratic National Committee have not responded to repeated requests for comment about Jewell's scandal, as well as when he was officially removed from the ranks of party leadership. State Republicans are now accusing Democrats of ignoring a scandal in their midst. Party spokesman Tony Zammit said Democrats are attempting to "sweep it under the rug" in the hopes that voters in the state do not tie a business and labor scandal to local politics. He said the state and national party owe Michigan voters and the public an explanation as to why he was able to remain a party leader for so long. "It is ridiculous that someone guilty basically of embezzling money [from union members], someone guilty of a felony is responsible for picking the Democrat's presidential nominee," he told the Washington Free Beacon. "They try to sweep this under the rug, but they still haven't answered questions about whether this man is going to Milwaukee next year." Republican National Committee spokesman Michael Joyce said that removing Jewell from a website does not clear Democrats from the larger scandal. He was accused of taking luxury golf trips and other perks from company officials during a time at which he was supposed to be advocating for dues paying members. Some of the illegal activities in the scheme were alleged to have taken place at the time he was serving as a superdelegate. "Removing Mr. Jewell from the Michigan Democrats website does not take away from the fact that he was conducting illegal activities while serving in his leadership capacity," Joyce said. "Michigan Democrats are heading into 2020 with the same corruption problems that plagued them in 2016 while Republicans are united and fired up to reelect President Trump." Federal investigators indicted several union and company executives in July 2017 for alleged embezzlement of training funds meant for union members. 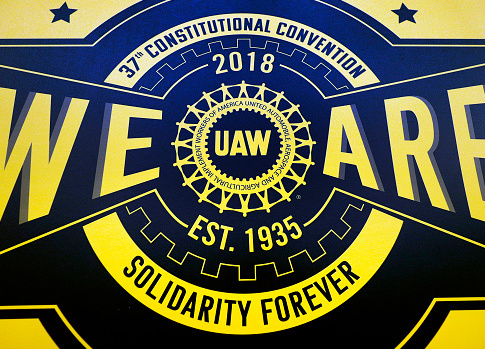 Jewell resigned from the UAW in December 2017, was publicly tied to the investigation in January 2018, and indicted in March 2019. Zammit criticized Democrats for not taking swifter action, noting that there has publicly been "no reprimand" beyond a removal from the website. "The people of Michigan deserve better," he said. Jewell faces up to five years in prison, though prosecutors are reportedly leaning toward a 15-month sentence when he will be sentenced in August. Even then he would be unable to cast a ballot in the 2020 Democratic convention in Milwaukee. This entry was posted in Politics and tagged Democratic Party, Michigan, UAW, Unions. Bookmark the permalink.